Often recognized as one of the top resort spas in the country, The Spa at The Omni Grove Park Inn is certainly an oasis for pampering. 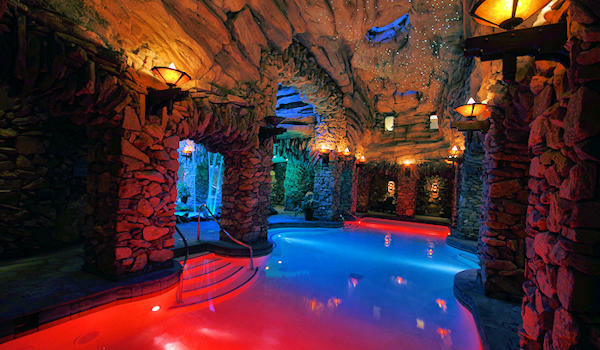 Built into the side of the mountain, you'll feel worlds away in underneath the rock arches of the luxurious spa. In addition to a long menu of spa treatments in their exclusive Heaven Series, there are many amenities to enjoy before and after a massage, facial, pedicure or manicure. Soak in mineral pools with soothing underwater music and waterfall pools. Photo above: Lap pool with 6,500 fiber-optic stars overhead. 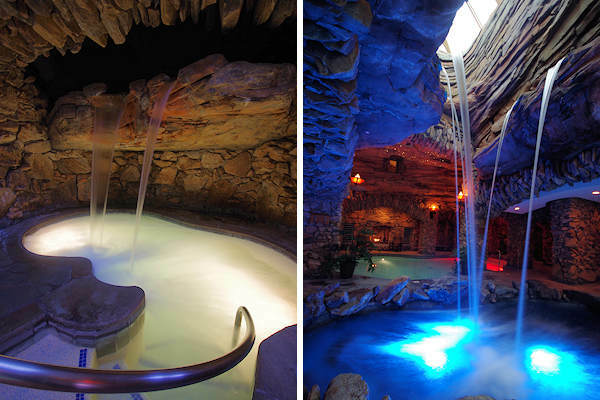 Soak in a therapeutic waterfall pool. Also enjoy exhilarating contrast pools, inhalation rooms, saunas and eucalyptus-infused steam rooms for both men and women. Grab a warm blanket, light snack and hot organic tea at three fireside lounges with seating designed for relaxation. 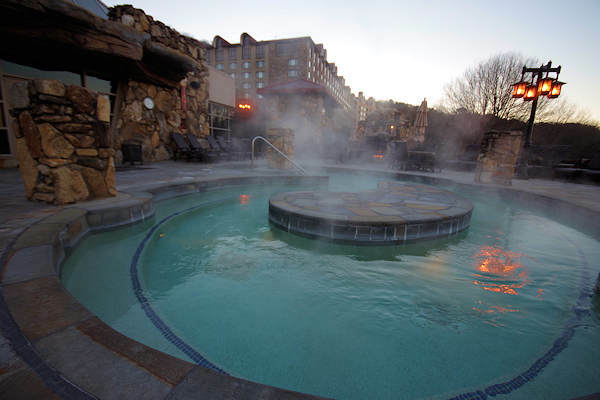 Treat your eyes to views of the Blue Ridge Mountains on the Spa's outdoor terrace in the toasty whirlpool, perfect on a cool evening to end your day. The spa is open every day 8 AM-9 PM and guests must be 18 or older. On weekends (Friday at Noon through Sunday at Noon) and holidays, day passes and spa treatments will be available only for overnight guests staying in the hotel. On Monday through Thursday, excluding holidays, day passes and treatments will be available to both day guests and overnight guests, based on availability. Make reservations well in advance, since prime time slots can book 3-4 months in advance. Day passes are not sold in advance. See details and a full list of treatment options on their Web site.